As a breezy and sarcasm-soaked account of one man’s very unsuccessful attempt to repeat what McManus accomplished in 2000, The Noble Hustle does not earn a rightful place in a tradition begun by Alvarez and continued by McManus. Pingback: An Agnostic’s Take on the Fall of Man « .rebeliever. Sometimes I wonder why I stare at this 13 inch screen until my eyes are sore and don’t quite focus; then I find a Mother Load like the three articles in a row on Isak Dinesen, Genesis, and Naples. I want to give The Millions crew and community for the generally high level of content you put out daily. I have thought about Genesis recent after reading Out of Eden which interprets the Adam and Eve story to tell the origin and nature of evil. This article brings the story closer to home, to the lives we (me, my partner, my friends) live in our femaleness and maleness, our pain and paradise. This is really finely written…you’re lucky to have grown up without religion, I was, and it definitely left its imprimatur. I’m not a very big fan of religion organized or otherwise myself, but I do think its ultimately a form of unified literature. Appreciating a holy book for its literary qualities is, as far as I’m concerned, a form of secular piety which sheds dogma and culls the living flower. Your piece does this, with grace and honesty. Thank you. 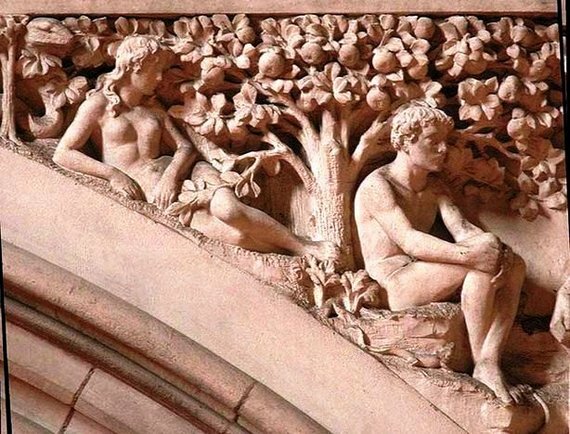 As a Mormon (a Reform Mormon) my approach to the Adam & Eve myth is different from Protestants and Catholics–and yet it somehow reverberates with this Agnostic view. Mormon theology rejects any concept of Hell and Eternal Damnation, instead viewing humans (spirit/mind and physical body) as existing in the image of God. Because of human intelligence (which Mormonism defines as “the glory of God”) the human mind has the ability to comprehend higher, more abstract , more complicated and more complex levels of knowledge–continually, throughout all of eternity, until (as the serpent and the LORD God on the Genesis account testify) “they become as gods.” In the Mormon scheme of things, God is not robbed or offended, but further glorified when His children (humanity) progress, mature and eventually take on His image. But the path of this Eternal Progression begins when the Fruit of the Knowledge of Good and Evil is eaten, and childike innocence and ignorance is left behind. “A man cannot be saved in ignorance,” Mormon scripture states. Eden must be forsaken and the seemingly “lone and dreary world” must be entered and embraced.